PuzzleMad: Can Bolts be Wise? Nope! But they can be very puzzling! I have barely managed to do any puzzling for a week or two due to a combination of work and fatigue! For some reason I have been doing an awful lot of on-call recently (I really should have a damn serious chat with the rota organiser sometime...oh, that would be me! Doh!) On Tuesday night I managed to achieve a whole 2¼ hours of sleep which basically wiped me out for 2 days afterwards - I had to sleep most of one day and then was fairly zombified the following day which many would say is my normal state. I'm certainly getting too old for that. Then yesterday (Saturday) was another day on call and after a fairly exciting time of major blood loss and trauma, puzzling was not really on my mind. 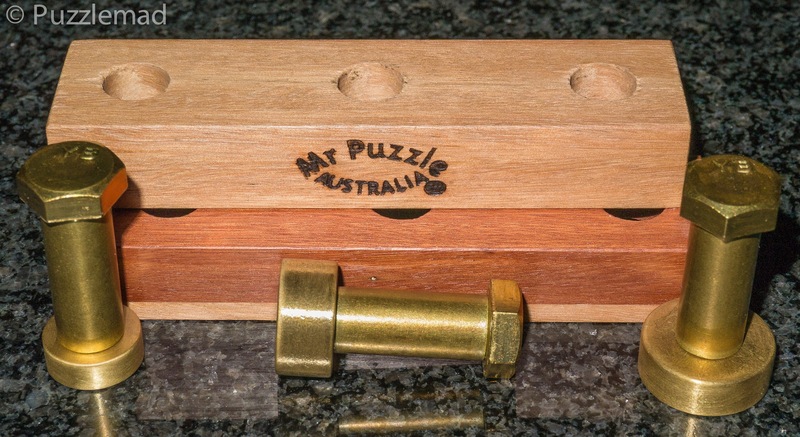 Luckily last weekend I had finally managed to solve one of the most challenging puzzles in a long time, the 3 Wise Bolts Sequential Discovery Puzzle from the Master of the sequential discovery, Brian Young. The puzzling world is a little distracted just now as the International Puzzle Party is being held in San Diego as I write this - from the photos I have seen, they are all having a fantastic time. Now before some smart alec comments to me that this is NOT a puzzle I should have bought because it is a "box", let me just say up front that I do own some puzzles that have cavities if they have some other puzzling feature to them. Yes, it does say in Brian's description that the aim is to "discover the 2 round compartments inside the box" but I am sticking with the full name of the puzzle as it calls it what it is...a sequential discovery puzzle. This type is my absolute favourite from the puzzle classification and unlike many perviously made this is a VERY reasonable price of about $123. When you consider that Brian has had to manufacture a large number of brass as well as wooden components, this is a tremendous value for money. The wood used for the top and bottom slices is Blackbutt and the slice of reddish wood in the middle is Rose Gum. It is a nice portable 123 x 38 x 30mm and having solved it, I intend to take it to work for a while to bamboozle my colleagues. "Brian designed the puzzle with the view that the first two bolts to be removed should be tricky but not ridiculously difficult. He wanted to keep you interested in progressing through the puzzle. But that all changes when you get to the third bolt; the wisest one of them all! Solving this final step should give you a really good Aha! moment. Just like the 3 wise monkeys, you’ll need all your senses and more to do this one. Hear, see, think about it, maybe hear again.... and once you’ve solved it speak no solution!" I started one evening with a cat on my lap and the TV distracting me. Within a few seconds I was able to turn the middle bolt and then I couldn't again...and then I could! Very odd because sometimes the same movement would not let it turn at all! Rather than just carry on fiddling I kept moving on a step and back trying to work out why it was happening. I thought for a while that I had it sussed when I suddenly had a similar blockage occurring in a different position...hmmm! A small mental image was forming which is lucky because I am a small bloke and many of my colleagues have said that I am "mental"! I certainly have a very small brain! Having understood the first part, I moved on and suddenly the cat was very interested in the puzzle when a small "something" landed on his head - immediately after this there was a little fight and I removed the small "something" before the cat could eat it. Oooh! This will be useful. I started to try a few things using the newfound tool but it wasn't going to work. Back to the drawing board and I realised using one of my senses that there was something else inside. A little more fiddling and the cat and I had another wrestle. NOW I was able to do something new - AHA! After this the first of the bolts was off - as Brian had intended, it was only a little thought and discovery. Will the same thing work on the second of the bolts? Not for me it wouldn't! Think© man! I'm not very good at the think thing but I thunk and thunk and thunk and suddenly I had a second bolt! Well, if that was supposed to be easy then Lord help me with number three! I did have an idea of what I might do for the final bolt. I had a nice image of the inside of the puzzle in my head but there was a crucial feature missing from the head of the bolt. Some construction or further discovery was going to be necessary...and here I got stuck. I tried a lot of things but none of them was quite the right size or shape and the puzzle remained closed. I'm ashamed to say that I was failing to solve it despite having solved the 4 bolt bersion that was Brian's entry into the IPP design competition last year. I had seen the puzzle at an MPP a few months ago but had been scrupulous in not watching anyone do the final solve. I worked on this on and off for a week without success. All dismantled - no hints visible here, I'm afraid! It would appear to be a sort of box too! The next step is to put it all back to the beginning. Most of this is not terribly difficult if you remember the dismantling sequence. I would say that it does take a bit of thought to put all the internal pieces back into the correct positions so that the strange beginning sequence is still required. Lovely! This is one fantastic sequential discovery puzzle and one of the very few ever to be sold with a reasonable price. Go buy it from Brian and Sue's store, you really will not be disappointed. In the meantime, go and have a quick look at Shane's site - despite vowing he would never manufacture an IPP exchange puzzle again, he has had another mental lapse and made not one but two! Like me, he is a sucker for punishment! But unlike me...he is VERY bright! Hopefully I will get some time to do some puzzling this week or there won't be a blog post for you!